While cycling to work one morning, a local coyote advocate spotted a rancher in his sheep pasture. The rancher had a pair of binoculars dangling around his neck and a rifle slung over his shoulder. The advocate stopped to get an update on how the rancher's two new great pyrenees guard dogs were performing. A few days later, the advocate related to me his conversation with that rancher. I'm sharing their dialogue because of how it reveals that rancher's attitude, depicts his success with using nonlethal deterrents to keep his sheep and nearby coyotes separate and alive, and shows that advocates and ranchers - often portrayed as snarling at each other - can communicate. 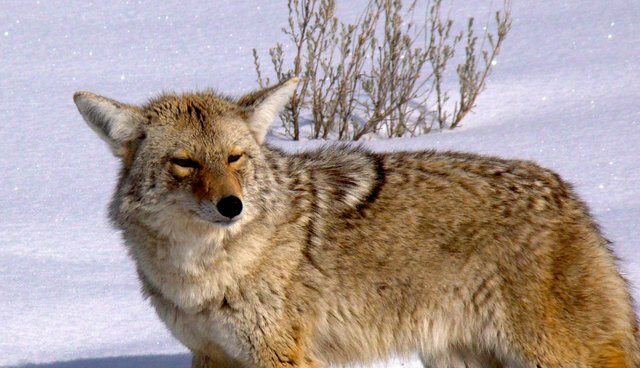 After exchanging greetings, the advocate motioned toward the rancher's rifle and said: "You're still needing to shoot coyotes?" "Well, I'm always prepared to," the rancher said with a wink. "But I haven't needed to since I got the dogs." The advocate breathed a silent sigh of relief and asked, "Have you lost any animals since getting the dogs?" "I lost one ewe and lamb near the barn over there just before the dogs arrived. But those dogs are doing a great job. In fact, I just put another $300 check in the mail for a third one." "So the extra expense of buying dogs doesn't bother you?" "These lambs are going to be worth about $200 a piece in a little while so the dogs only have to save a few to make the buying worthwhile." The advocate nodded and touched the dog bowl with the tip of his cycling shoe, "What do you feed them?" "They get dog food, but I also run a meat business so they get tails, hooves, and other animal parts too." Gazing at the road, he added, "This morning when I pulled in, someone was standing at the fence photographing the dogs and feeding them dog biscuits." He shook his head and frowned. "When these dogs don't work it's usually because they get treated like pets." "How will you deal with that?" "I'm going to put my hot-wire fence out soon so the dogs can't get near the road and that should solve the problem of people petting and feeding them." "What convinced you to try the dogs in the first place?" "When I moved the sheep to this pasture, I thought it would be a perfect location for the dogs. I think it's my job to keep an eye on things during the day when the dogs are resting, but it's during the night that the dogs are really valuable." The rancher motioned to his right and added, "The sheep usually sleep on the bedding near the gate at night so it's easy for the dogs to keep an eye on them." Satisfied, the advocate looked at the dogs and the sheep and was preparing to leave when the rancher locked eyes with him and said, "You know, not all coyotes kill sheep. You don't have to kill them all." Rick Lamplugh is a coyote and wolf advocate and author of the Amazon bestseller "In the Temple of Wolves." Available as eBook or paperback Or as a signed copy from the author.